Felicia Mason over on the Love Inspired Authors’ Blog; today, I want to introduce you to one of the most inspiring authors I know, Sally Hobart Alexander. Almost every week, Sally and I meet together in a writers’ group, often at her house. Each person reads aloud a section of a work in progress, and then the rest of us offer suggestions, feedback and criticism. Sally is the only one who doesn’t read her work aloud; instead, she has another member of the group read for her, because she’s blind. Rather than making notes about people’s suggestions, she uses a recorder to keep track of others’ feedback. Despite the challenges caused by her visual and hearing impairments, Sally has built a very successful writing career and often visits schools to talk about her children’s books. 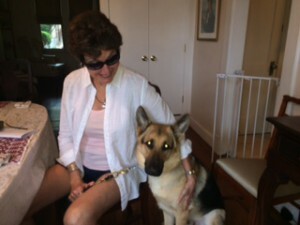 One of Sally’s goals is to educate other people about blindness. Her books have explored what it’s like to have a mother with a visual impairment (Mom Can’t See Me), have answered questions kids often ask her (Do You Remember the Color Blue? 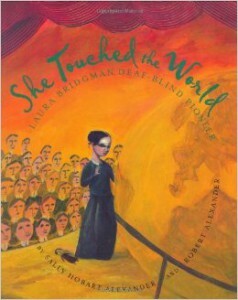 ), and have showcased historical figures with disabilities (She Touched the World: Laura Bridgman: Deaf-Blind Pioneer). Lately she’s been working on a couple of projects about guide dogs, informative and poignant tributes to the canine companions that have helped her live an independent, active life. I value Sally’s thoughtful feedback on my work and enjoy sharing weekly laughs–and sometimes tears–as we discuss writing, books, and life. For a chance to win a $10 Amazon gift card, which you can apply toward Sally’s or any other books available on Amazon.com, leave a comment about someone who inspires you in work or life by the end of the holiday weekend (July 5th). someone who inspires me? My mother-in-law is always there for any of her 7 children, 40 grandchildren, numerous great-grandchildren and anyone who she can help. At 83 I think she has so much energy & faith. Hi Lee! I love your story about Sally, what a sweet friend/fellow writer/book critique partner. She sounds like a wonderful inspiration for you and others in your writers group! I think the person who comes to mind as far as being an inspiration, would be my pastor & his wife. He always encourages us to stay in God’s word, live our lives pleasing to the Lord, and love one another. He not only preaches it, but he lives it!! His life is a testament to his faith :-) Not only are they inspriations in the church, but in their personal lives. You won’t find a more loving, funny, & fun-loving couple around! He has such a great sense of humor and his wife just adores him! They’ve been married 50 years now!! Not only have they been married that long, but they have also been in ministry that long. They inspire me to walk the straight and narrow & that you still can have fun even though you are a Christian! Isn’t it wonderful to have friends like that? Trixi, you won the gift card! Wow, that IS inspirational! I’ve let so many things hold me back for so long. I am inspired by people just like her who allow for no excuses. The person I’ll share about is my friend, Amanda. She is actually inspiring a main character in the book I’m working on right now. She suffers from several chronic illnesses. Fibro myalgia and MS are the biggest two. I know so many people who suffer, but none rise above it quite like Amanda does. She’s always cheery. She never allows anyone to make a big deal out of it. A few years ago she decided to try to take her health into her own hands and started a diet and exercise routine that eventually helped her get healthy enough that she was able to drastically cut back on her meds. I hate that she hurts, but I thank God for His example through her.